After your heart, it is your helmet that should be in the right place. And this place is definitely not some dirty cupboard in the attic or a dusty, ancient trunk. It is your precious head. Ever since the Deve Gowda-led Karnataka government decided to do away with the ‘helmet law’ in the mid-’90s, there has been a sharp rise in two-wheeler fatalities in the state. While successive governments have been dragging their feet over bringing in a legislation to again make this headgear mandatory, a unique ‘Keep your head, wear a helmet’ campaign is on in Bangalore that leverages the reach and impact of the internet to push the message home. The man behind this cerebral cause, Anish Verghese Koshy, 28, has himself survived a near-death experience (his helmet saved him). As president of Friends for Life, a group that focuses on urban issues, he would rather that youngsters on two-wheelers wear helmets than writhe in the icu of a hospital. "The campaign is all about responsibility. If we can save lives, we are doing our job. 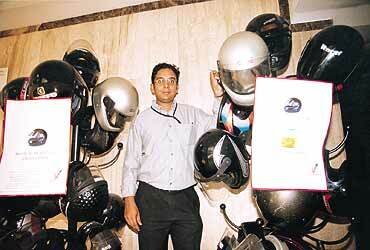 We need not wait for a helmet rule to be in place," says Anish, an assistant manager with I-flex Solutions Limited. The importance of helmets increases manifold in Bangalore, a city of six million people, where around 400 two-wheelers are added every day to the burgeoning figure of 1.6 million (statistics for 2002). Says Dr G. Gururaj, a who consultant on road safety and head of the department of epidemiology, nimhans, Bangalore: "More than 60 per cent of the 800-odd fatalities and 8,000-odd injuries in road accidents every year are traumatic brain injuries sustained by two-wheeler riders." Anish launched his campaign last year after his accident. In addition to coining interesting slogans that goad people to wear helmets—‘Is there a price on your head?’; ‘It’s your head that got you where you are today’; ‘Without a helmet, your head could reach the wrong destination’; and ‘There are a million reasons for not wearing a helmet, but none worth the price’—he provides a free communication kit, complete with relevant posters, stickers and wallpapers. The campaign has certainly had its effect on a large number of geeks who ride to work on two-wheelers in companies such as Infosys, Wipro, Phoenix Global Interactions and Tektronix. At I-flex, a slew of helmets in the reception bay bears testimony to the impact of the campaign. In some of these IT companies, the employees who turn up without a helmet have been asked to cough up a fine or park their bikes outside office premises. In recent months, Anish has moved on to spreading his message in college campuses. At jam sessions organised at four important colleges in Bangalore, a local band, Thermal and a Quarter, belted out songs with banners like ‘Keep your head, wear a helmet’ as the backdrop. On a few occasions, he has had senior ips officers and prominent doctors of the city talk to college students on the issue of protecting one’s head. The World Road Safety Council has accepted Anish’s paper for its annual conference in Durban this year. The Bangalore City police, too, has offered token support. It has permitted Anish to put up his messages on traffic signs along important roads and on traffic islands. Ironic, thinks Vidya Natampally, member, ciros (Citizen’s Road Safety). "It is a pity that citizens have to come together to initiate action for road safety, especially for something that is so basic in nature," she says. 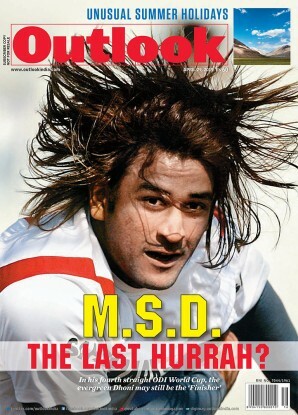 Anish has already made plans to take his helmet battle to Pune, Chennai and Thiruvananthapuram. "I am in touch with some friends and colleagues in these cities where the helmet rule is not in force." If you wish to know more about his crusade or join forces, write to him at acampaigner@yahoo.com or anish.koshy@mailcity.com.